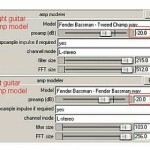 Tags: Guitar recording and mixing techniques. 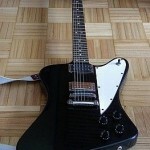 Distorted guitar is one of the most important instruments for rock music. 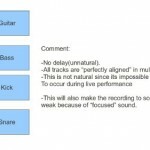 Most genre will use distorted guitar in the music production process, for example in pop, alternative, grunge, punk, etc. Because of this popularity, this short guide has been written to illustrate the important processes. This is written for someone who will use a personal computer (preferably Windows), a digital audio workstation (DAW) software (Cubase, Protools, Reaper, etc.) and a decent external audio recording interface (either in Firewire or USB) in recording the guitars. Budget audio interface for Windows are commonly USB type. If you don’t have one, you can read some recommendations here. If you are ready, let’s get started. Of course, before you will record the guitar overdrive sound; you need to set the tone. This is usually done by adjusting settings on the guitar amplifier (such as Marshall or Laney) where they have built-in overdrive effect. Adjust for that best tone you are targeting. 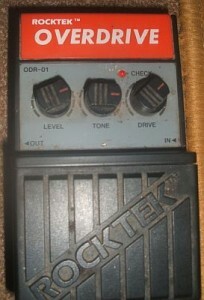 Another popular use are overdrive effect pedals. For example, I am still using my Rockteck overdrive pedal which I bought in 2004 and yet still works and sounds great for an extremely low price. Of course there are tons of overdrive pedal that can have much a better sound than this. Other important settings that you can implement that will influence the overdrive sound are the EQ knobs in the guitar amplifier. There is no standard EQ setting but if you want some heaviness and punchy overdrive sound, you may want to switch the mid and treble to slightly above minimum while setting the bass to average. Once everything has been set and you are happy with the sound proceed to the next section. To set this up, the following is the very basic signal chain for recording. 1.) Connect your guitar to your distortion pedal. 2.) 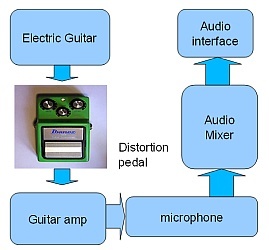 Connect your distortion pedal to your guitar amplifier. In some high-end guitar amplifiers; outboard distortion effects are optional because quality guitar amplifiers like Marshall, Laney and Fender do already have built-in effects on them such as overdrive/distortion. 3.) Adjust your distortion settings to the best sound you want to capture. 4.) Place the microphone around 4 to 6 inches from the guitar amplifier speaker (more illustration below). For best results, you should be using dynamic microphone such as SM57. If you don’t have SM57, SM58 will do. You can use two SM 57 pointing to the one guitar amplifier to get some phasing/stereo effect. 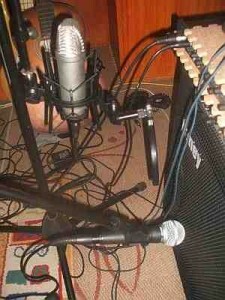 You can even use condenser microphones that you like. You can also utilize two guitar amplifiers during the recording with one microphone each. It all depends on your available resources. Use XLR balanced output cables to connect them to your audio interface preamp inputs. Don’t use unbalanced TS mono when connecting to your audio interface; this will become noisy in the long term. Read this tutorial on balanced and unbalanced audio for more details about this topic. 5.) Again for best results, don’t clipped the recording levels. Allow -6dB maximum peak recording levels for proper gain staging. Do some test recording and play the loudest part to be recorded, if it exceeds -6dB, try to lower the preamp gain for your audio interface. 6.) For each microphone you use in recording, this is equivalent to one mono track in your DAW. 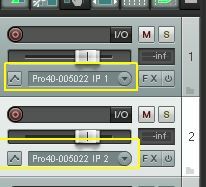 So in the example above where there are two microphones used, you need to insert two mono tracks in your DAW for recording. IP1 is Input 1 of the audio interface while IP2 is the second input. Then aimed these two tracks for recording by hitting the small red button; take note you are not yet recording but just aiming the track ready for recording. Always record in 24-bits. Minimum sample rate should be 44.1KHz. 7.) The signal coming from a microphone is very weak. You should be connecting the microphone to your audio interface preamp input as this will amplify the signal stronger in preparation to analog-to-digital-conversion. Read this article on the consequences of recording without preamp. Any audio mixer includes a preamp on them. 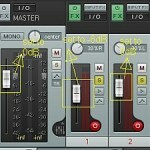 Make sure you use balanced XLR inputs when connecting the microphone to the mixer preamp. 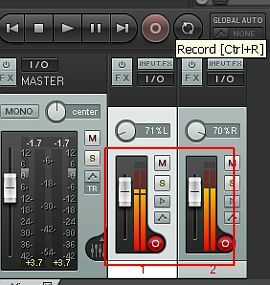 Recording direct to your audio interface using distortion effects are possible but this may not produce the best sound that you are expecting. It is because guitar amplifier tone is not captured before recording.